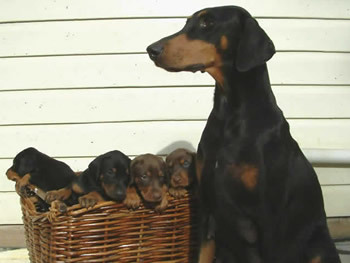 We have a well established reputation with the goal of breeding Dobermans true to the traditional bloodlines in Europe. A compact, healthy working dog with balanced drives and stability for training and ability to work. 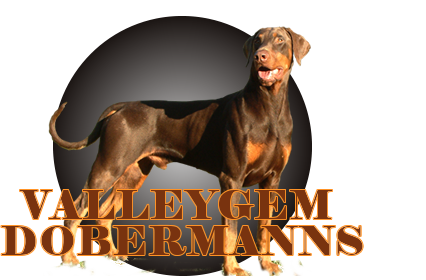 We think it is a privilege to breed the Dobermann and hope with the well researched ValleyGem breeding program to make a major contribution to the improvement of the the Dobermann bloodlines in Australia. All puppies are tested for specific drives such as play drive (retrieval) from six weeks of age to determine which individual puppy is best suited for a designated task. We specialize in dogs for companion/family pet, personal property protection, dog sports or ring sports and security for rural properties and horse studs. Our Dobermans are bred for physical robustness and training ability, true to the working lines of dobermanns in Europe of the past. Confidence, stability, ability to be calm and adapt to a changing environment balanced drives for work, Strong nerve, full mouth grip with a high aptitude to make the right decisions and a willingness to please. We are looking for a compact strong shape athletic and less pre-disposioned for physical unsoundness. Our dogs are VWD tested to ensure health longevity. Some of our dobes have lived until the very mature age of 15. Breeding dogs with solid bones, compact strong backs we find are more orthopedic sound and a more athletic and hardy dog. 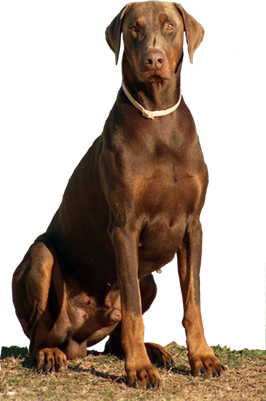 Our dobermann breeding dogs are farm dogs with acres to run. We choose our breeding dogs for train ability and reliability in a high stimulus environment. 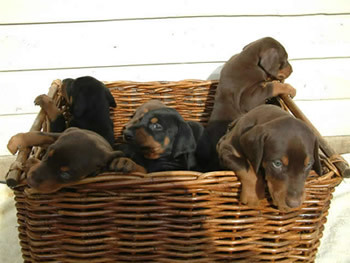 Our dobermanns have a high aptitude with an exceptional outgoing nature which makers them socially stable. We believe in a natural diet of fresh meats, vegetables, fruits, cereals, and quality mineral supplements . All puppies come with a colorful booklet presentation covering a healthy diet, the daily care to keep your puppy healthy and proven training hints. We do not promote commercially processed food. 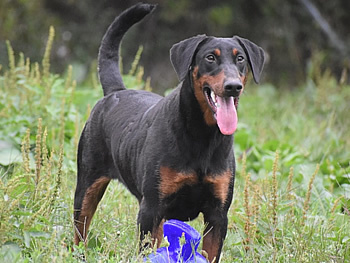 We pride ourselves to breed Dobermanns with an outstanding pleasing attitude with a lot of time spend on the training and imprinting of your puppy. We also provide ongoing assistance and breeder support.